1) For one or two joists side by side, use 10dx1 1/2” nails from each side. For 3 Joists side by side, use 16dx3 1/4” sinker nails from one side and 10dx1 1/2” nails from opposite side. For 4 Joists, used 16d sinker nails from each side. 2) Use hanger capacity or Joist shear capacity whichever is less. Joist Shear capacity shown * exceeds hanger capacity. For these joists use hanger capacity. 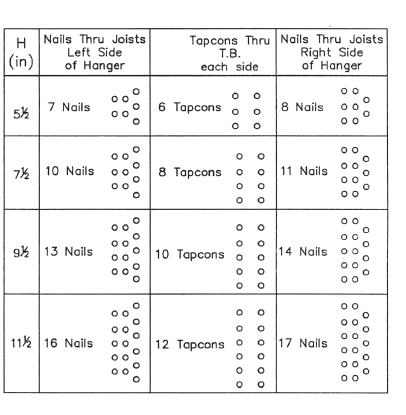 Hanger Capacity is based on Capacity of tapcons in Concrete beam. No increase allowed for uplift. 6) All nail values in wood conform to latest Edition of NDS for Southern Pine, G=0.55. Values for other species shall be adjusted as per NDS. 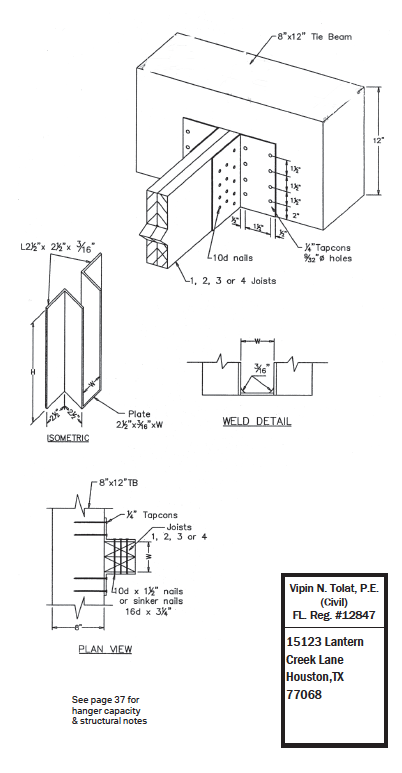 This applies also to shear values of joists. Design values of 1/4” Tapcons, 1 3/4” Embedment shall be per ITW Red head’s published catalog. 9) F’c Tie Beams shall be 3000 psi.